Vendors operating in the global telecom enterprise services market can benefit from opportunities created by the increasing commercialization of cloud services in traditional markets such as outsourced billing for OTT players, observes Transparency Market Research in a recent report. Companies can also focus on the emerging cloud segment as a means to enter emerging segments such as cloud-based M2M platforms for various industry verticals. An understanding of critical partnerships and evolving cloud ecosystem and implementing appropriate business models is likely to be vital, as telecom operators shift their focus from communications services business to on-demand ICT capacities service providers. Some of the leading companies operating in the market are X4 Solutions, Business Communications Management, Inc., WTG Technologies Limited, Telecom Brokerage Inc., Intelisys Communications, Inc., Telecom Brokers, Intracom Telecom SA, Converged Network Services Group, Advoda Communications, Inc., and Telarus Inc.
Transparency Market Research estimates that the telecom enterprise services market will reach a valuation of US$237.5 bn by 2025. The market is projected to expand at a CAGR of 4.1% during the forecast period 2017–2025. In terms of end-user, the large enterprise segment with over 74.9% share in 2016 was the largest market in the overall telecom enterprise services market in terms of revenue. Over the report’s forecast period, however, the segment of small and medium-sized enterprises is anticipated to expand at the most promising pace during the forecast period. Large numbers of startups being set up in the field of IT and ITeS across the world are expected to contribute to the global SME end user telecom enterprise services market. 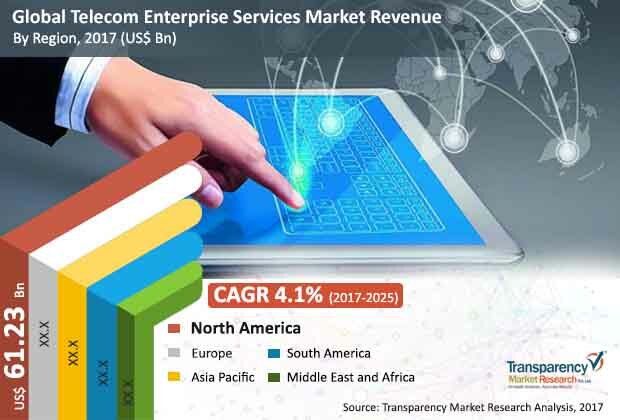 North America led the global telecom enterprise services market in 2016 with a share of about 35.9% in 2016 of the overall global telecom enterprise services market. There are approximately 4,000 independent communication technology partners and vendors (associated with Telecom Association (TA)) who consult with business end-users. North America is also one of the regions with the highest mobile penetration rate. As a result, the region is expected to remain one of the key revenue opportunities for the global telecom enterprise services market. Demand for enterprise services is expected to surge in coming years with the expansion of micro, small, and medium enterprises (MSMEs) and the vast rise in industrial activities across the world. In addition, increased influx of investment in the industrial sector and steady economic growth of emerging markets in countries in the APAC region and increase in worldwide enterprise IT spending across several verticals are further expected to drive the growth of this market over the forecast period. In developed markets such as North America and Europe, higher adoption levels of advanced relevant technologies, supported by healthy concentration of master agents and carriers, rising demand for cloud computing, data center and Gigabit connectivity solutions to support entire IP infrastructure will significantly magnify the adoption of telecom enterprise services. Presence of a large number of SMEs as well as favorable government regulations encouraging growth of small businesses will also drive the market in these regions. Emerging markets such as Asia Pacific are witnessing a surge in the number of startups providing web-based services for manufacturing firms operating in other application sectors.